I have always wanted to live in a place that I could easily ride my bike to the grocery store, library, or any other place I need to go. When we moved away from Kansas, that was our intent. Although we live in a lovely place, it isn’t super bike friendly. However, a few weeks back Alexander and I were discussing the cost of gas and ways that we could reduce our driving. He asked, “What places do we drive to regularly?” We agreed that the library (6.5 miles round trip) and Trader Joe’s (8.5 miles round trip) were two places we drive to every week that are within the mileage we felt we could ride our bikes to without any problem. 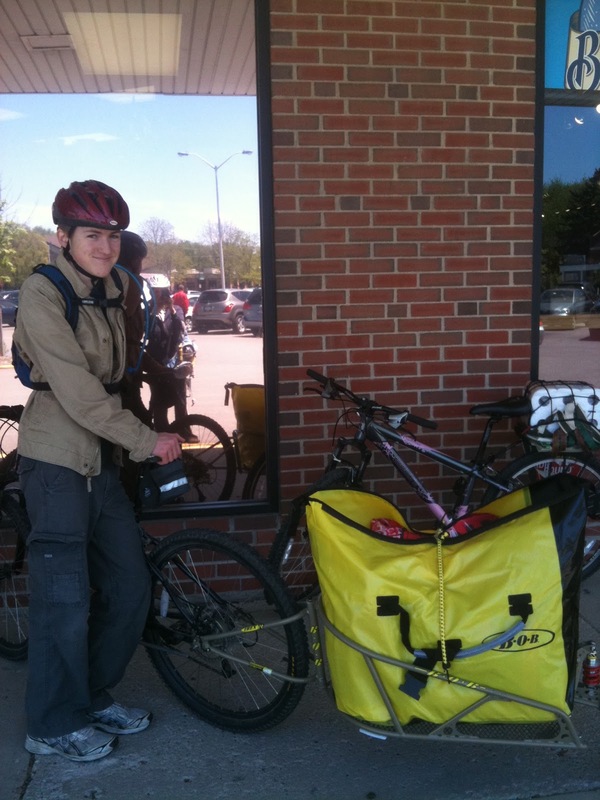 Once we made the decision to use our bikes on a weekly basis, we needed something to carry our groceries in. Steve found what looked to be a great bike trailer for us and yesterday afternoon Alexander and I set out for our first shopping trip via bicycles. While we were shopping, I kept saying, “I am nervous this isn’t all going to fit in the trailer.” Due to some impressive problem solving by Alexander, it did all fit. As we were jumping on our bikes to head home, we ran into a neighbor and talked with her a minute. Then we were ready to take off. But yikes, there was a problem. The trailer, which only has one wheel, was too heavy and kept trying to pull Alexander’s bike down. He tried a few things, but the trailer was just too heavy. So, we thought fast and found our neighbor who was still in the parking lot. Thanks to her our groceries made it home via mini van while we rode our bikes home. We returned the trailer last night and will look for something that fits our needs better. As Alexander and I talked about our trip, we decided it wasn’t a failure. Getting on our bikes and riding to the grocery store made an everyday event more like an adventure. We had fun working on the problem at hand together and felt good getting outside on a cool day. And, we were so thankful that our neighbor was out shopping at the same time we were yesterday!